In February 2010, Project Turn•Around was renamed The Turn•Around Agenda (TTA) Since its inception, The Turn•Around Agenda has served as an agent for change, developing an array of program initiatives to address the critical needs of urban youth and families in the greater Dallas community. In the early 1990s, a principal at a Dallas local high school contacted Dr. Evans about their dire need for a strong black male presence in the school. At that time, the school was experiencing a high occurrence of gang activity and other disruptive behaviors by students. The Turn•Around Agenda responded by sending 12 men to walk the halls and restore order to the school. Before long, the school began to experience calm and stability. A stronger atmosphere of learning emerged. 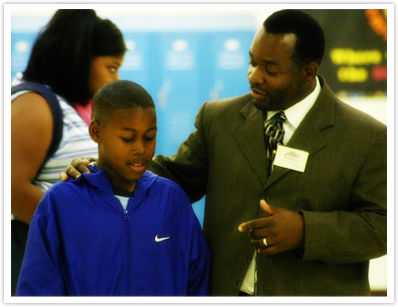 In short, these men administered tough love—a genuine concern and care for the students while maintaining discipline and accountability. The social impact of TTA’s intervention in this one school quickly spread to other neighboring schools. What began as crisis intervention in one school has become proactive intervention in now 73 Dallas County public schools participating in the church-adopt-a-school initiative through TTA.